We are very excited to announce that Diamond Way teacher Mark Pace will be visiting Singapore in the end of October. 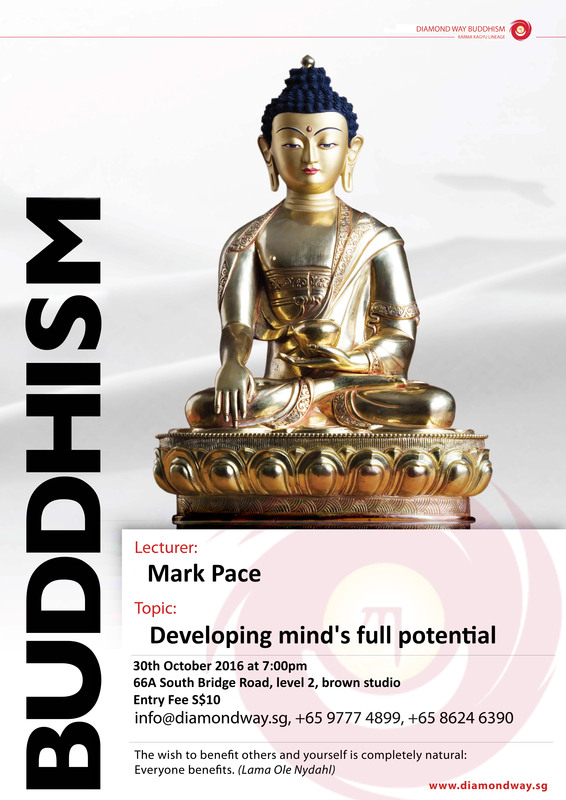 Mark will be speaking about how the methods of the Diamond Way Buddhism can make our lives more meaningful and happier. The full potential of our mind is limitlessly joyful, with a tremendous capacity to benefit others and ourselves. But without development, our capacity for happiness will remain latent – unrealized and undiscovered. If we use them, Diamond Way Buddhist meditation methods enable us to experience the full potential of our mind in everyday life, without having to change our culture or lifestyle. Mark will be speaking about how we can practically use this methods in our everyday busy lives. There will be an opportunity to ask questions and to take part in guided meditation. Hope to see you there! Mark Pace met his teachers Hannah and Lama Ole Nydahl in Sydney 1996. After travelling with them extensively, he founded the Canberra Diamond Way Buddhist Centre in 1997 together with his friends. Lama Ole asked him to start teaching in 2003. Mark lives in Canberra and has a young daughter. He studied philosophy, political science, and business, and works in communications. He loves travelling, enjoys reading and keeping fit.